Now this is something I find troubling – right up with flushed hormones and human pharmaceuticals entering the water course. Nanoparticles made of titanium dioxide are affecting fish performance. They don’t swim as fast as normal. Scientists say the particles get into fish gills and cause oxygen deprivation. 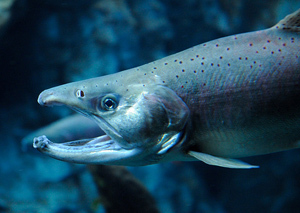 “We’ve shown that nanoparticles have similar effects on fish to trace metals like copper – they produce hypoxia [oxygen starvation], which in turn leads to poor muscle performance, neurological problems and changed behavior,” an EarthSky story today reports. Nanoparticles are used in a variety of products from sunblock to socks. This entry was posted in Uncategorized and tagged Clean Water, Environment, Fish, Nanoparticle, Nature. Bookmark the permalink.